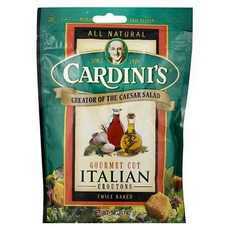 Enjoy Cardini's Italian Herb Croutons. This Exciting Line Of Cardini's Croutons Tops Off A Story Of Legendary Quality And Taste. The Taste Legend Of 1924 Lives On In This All Natural Italian Herb Crouton. (Note: Description is informational only. Please refer to ingredients label on product prior to use and address any health questions to your Health Professional prior to use.